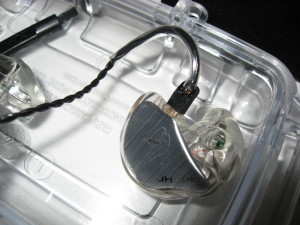 JH Audio is one of the most popular custom IEM brands on head-fi, if not the most popular and well known worldwide aside from Logitech Ultimate Ears. They are also very popular outside of head-fi with the professional musician crowd, more than likely because the company was founded by the influential Jerry Harvey. They have a full lineup of products ranging from the dual driver JH5 up through their just released JH-3A which is essentially a JH16 with active crossovers and individual amps for each frequency spectrum. There are many models between the JH5 and JH-3A, with the two passive flagships being the JH13 and JH16 depending on the amount of bass you want. I decided to go with the JH16 as I was concerned the JH13 may have been too bass light (I heard a JH13 demo and wasn’t overly impressed, but that is a whole other story and not necessarily reflective of the JH13 in customized form), so here I am. Reading the many many JH16 reviews and thoughts on head-fi I came across positive, negative, and neutral impressions, so I am glad I get to hear them for myself to figure out the performance from a sound signature and technical perspective. On to my review where I will let you know how I hear the JH16, what it does and doesn’t do well in comparison with similarly priced custom IEMs. 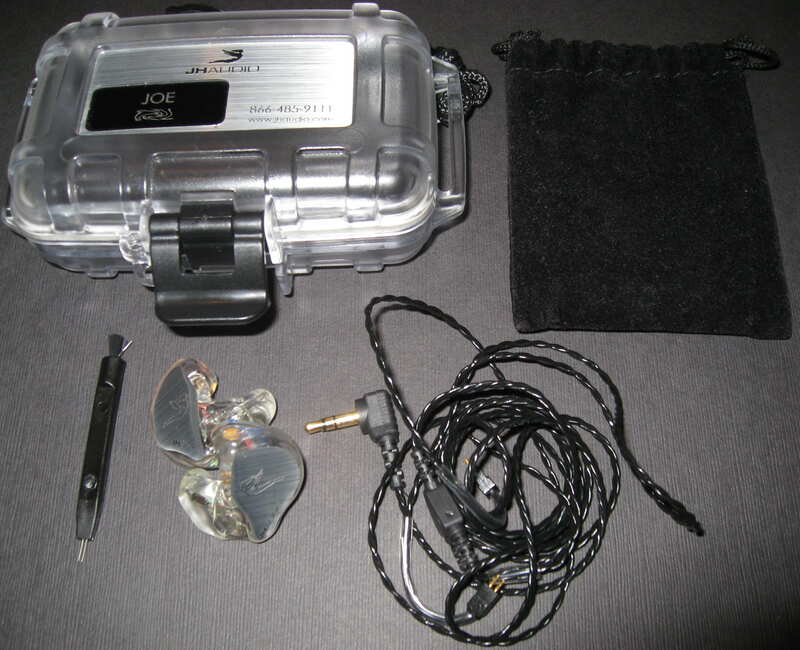 My other custom IEM reviews can be found here. The JH16 retails for $1149. Order by selecting your product on the website and choosing your options, then pay. If you want to use PayPal Brittany can help you so shoot her an email. There is a list of audiologists here, so get your ear impressions and send them in. I worked with their art department for my custom artwork and Zac was very responsive to all my questions. The turn time was 13 days from order to shipping, and they were ready when I was on vacation so I had them shipped there with no problems. The JH16 uses 8 drivers per ear with 2 dual bass drivers for a total of 4 bass drivers per ear along with dual midrange and dual treble drivers. The bass drivers are customized for JHA so you won’t find them anywhere else! The shell is acrylic and has detachable cables. JHA prides themselves not just on the sound of their products, but also the artwork so you can have the look you want also. 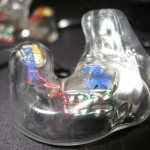 Having 4 drivers per ear for bass seems exciting, especially for bass heads as it puts the focus on the bass. Below I will answer the focus question, but there is no doubt the bass is enhanced. The JH16 comes with an Otterbox case with your information inscribed in it, a drawstring soft pouch, and a cleaning tool. The accessory pack is not lacking anything, however the Otterbox case does not have any liner so your custom will clank around inside unless you also use the drawstring pouch and the cable can get caught in the seam when closing the Otterbox; not good. So, I do use the drawstring case along with the Otterbox and have to make sure I have the pouch in at a certain angle to fit properly. But, once it is in the case it is very well protected. The JH16 cable is a typical custom IEM cable and I chose black so I wouldn’t have another cable that would turn green over time. 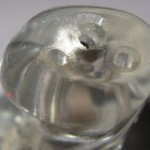 I did have a problem with the cable as the plastic on one of the shell connectors split and came off. After contacting JHA they told me to send the cable back and then they would send me a new one, which they did. The turnaround time for the cable was 11 days as they sent the replacement via UPS ground. Other than that, the cable is as expected from a black custom IEM cable. See above for the cable information. Otherwise the shell seems very well built and I don’t anticipate any issues with durability of the shell, not to mention they come with a 2 year warranty. 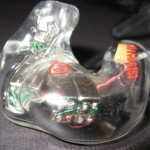 Isolation is the same as my other acrylic shelled custom IEMs attenuating approximately 26 dB. The JH16 received 100+ hours of burn in as is customary before I do my serious listening. You can read about my technique here. For perspective I compared with the Starkey SA-43, SE 5-way Reference, Rooth LS8, EM3 Pro, UERM, and EP-10 Plus. Out of the box the JH16 was extremely punchy and dynamic, too punchy as I was pummeled with bass that was noticeably more enhanced than anything else in the price range. The treble was also a little rough around the edges. Over time the bass punch settled down and the treble smoothed out which allowed me to focus more on the midrange. Bass: With so many drivers devoted to the bass, one would think the focus of the JH16 is the bass. And jumping to an overall performance comment, while the bass is enhanced, it never overpowers the rest of the spectrum or makes itself the focal point of the presentation. Many enhanced bass headphones are warm but the JH16 manages to have enhanced bass without being overly warm or even very warm, sounding more neutral in the mid-bass region. But when 100 Hz rolls around the enhancement really kicks in. Detail is excellent, the ability to reverberate with bass notes in today’s pop music such as Lady Gaga and Flo Rida is substantial as well as the best performance I have heard from a BA IEM with Billy Idol – Prodigal Blues, where it rumbles with the authority of my car subwoofers from back in the day. With my wide range of songs the bass can either be very enjoyable or can be a cause of annoyance depending on which song comes on next. I will say the JH16 bass is fast and punchy yet can sustain a note, but the overall sound is a little different than the competition. Both the attack and decay are very fast and with four drivers per side that fast attack can and does have a lot of SPL behind it, but it is still a fast and punchy performance. This leads to more dynamics and ability to hear the nuances in bass notes than with anything else I have heard with my electronic music, but with acoustic music I get a sense that the note thickness is a hair short when comparing the others in the price range. Now, on to the not so enjoyable…easy listening, country, much of my rock, and some classical where the bass is overly enhanced with softer and laid back songs, bringing punch and power that I don’t think the artist intended. In comparison with the dynamic bass driver custom IEMs I have heard (EP-10 Plus, TS842, Merlin demo) the JH16 is superior in speed and punch, but about equal (depending on the model) in texturing while falling short on many occasions in reverb and sustained notes. However, the JH16 does make the dynamic drivers sound a little slow and bloated as well as a little short on detail. So, is the JH16 the king of bass, or even the king of BA bass? It depends on the type of bass and what you want in your bass. While the JH16 does have better punch and exceptional dynamics with great speed which works well for pop and electronic it doesn’t have as natural sounding decay to my ears with acoustic material. Midrange: Continuing from the not too warm bass, the lower midrange of the JH16 is fairly neutral and flat from a frequency response standpoint until you get into the upper mids where there is a slight dip before the response starts to increase to the peak at around 6 KHz. However, the presentation does shift a little from a more analytical bass presentation to a more liquid lower midrange presentation. Detail is ample, although not quite as much detail as the bass and treble. While the differences are not big, the added liquidity gives a smoothness to vocals, however the upper midrange peak also makes vocals sound brighter than on all the competition except the LS8, which is brighter but also more liquid. The UERM does have a similar tonal sound, but not the brightness in vocals is a little less. Treble: Testing with test tones for frequency response, the treble on the JH16 starting at the 6K peak, it isn’t the flattest in my ear beyond that with some peaks and valleys which aren’t all that large except for one big drop off which occurs at 16.5K. I say there is a drop off because I could then again hear 18.5K and 19K test tones, which is the first time I have ever experienced a complete drop off in the frequency spectrum . So, not accounting for the 18.5K-19K blip in the treble, the JH16 is short of the LS8 and SE 5-way performance and slightly less than the UERM which extended to 17K. The JH16 is on par with the SA-43, although the SA-43 tapers off starting sooner than the JH16 and a little better than the EM3 Pro and EP-10 Plus performance. So, how does it actually sound? The treble is sparkly and analytical due to the note thickness and while it is smooth in general, it isn’t the smoothest, nor the sharpest of my comparison group. The UERM has a sharper treble presentation as the JH16 is more forgiving of poorly mastered tracks. The rest were in general smoother including the LS8, which has a richness across the spectrum including in the treble. Those that like bright presentations will be happy with the JH16 and the upper audible range will add some air depending on the recording. There is no lack of detail in the notes, but in some tracks cymbals don’t shimmy with quite as much energy the way they do on some of the competition due to the quicker note. Presentation: Expansively wide, the JH16 soundstage can be termed large but the height and depth of the soundstage fall behind the competition. With some music such as pop and many electronic tracks this isn’t an issue as the soundstage of the track isn’t very 3D, but for spacious tracks the resulting sound is compressed and instruments can sound unnaturally close, lacking proper placement with takes away from the ambiance of the recording. While the JH16 offers good clarity, the clarity is in part due to the 6K peak, but the soundstage presentation can reduce the overall clarity due to the depth and height compression as instruments interfere with each other’s space. As noted above, the presentation is on the analytical side with quicker note decay than the SA-43, EM3 Pro, SE 5-way, and LS8. Overall instrument detail levels are very high, only bested by the LS8 and SE 5-way, however the separation between instruments and audible definition of the space is poor in comparison with spacious tracks. Transparency is good, but the JH16 doesn’t disappear quite as much most of the competition, giving more of a studio feel where I am studying each instrument vs being encompassed by the presentation on a great deal of acoustic and rock tracks. But with pop, rap, and electronic that lack depth to the presentation the JH16s width is more prominent than most of the competition except the SA-43 and EP-10 Plus. The speed of the JH16 is apparent and it does have a very punchy and quick sound, more so than the competition, although the LS8, SA-43, and SE 5-way can keep up and is the fastest of the competition, although this is at the expense of added liquidity and richness. M-Fidelity SA-43: (presence off, extra bass on) Upon first listen these two sound somewhat similar except for the upper mids and higher in the frequency range where the SA-43 is flatter vs. the brighter JH16. Overall the JH16 bass goes a little deeper, is faster, more detailed, is more enhanced, and has more headroom, although I wouldn’t say the differences are large unless you are using a low power DAP as a source. While the SA-43 has enhanced bass with the switch on, the enhancement is primarily in the deepest registers while the JH16 starts at a higher frequency and in turn the deep bass of the SA-43 has more rumble in general even though the JH16 can produce more rumble when needed. An example of the differences is can be seen with Billy Idol – Prodigal Blues where there was a fairly large difference in deep bass rumble but with Massive Attack – Angel the difference was small. The lower midrange is fairly close between the two but below that the SA-43 is a little warmer. There is a dip in the mids before the 6K enhancement with the JH16 and the SA-43 is flatter throughout the midrange. While the JH16 has a little more liquidity to the midrange presentation vs the bass and treble, it still is more analytical compared with the midrange of the SA-43. The upper mids/treble of the JH16 is brighter with more sparkle as well as a more analytical presentation making the SA-43 sound a little on the flat side or to me more neutral. From a presentation standpoint the JH16 reproduces more instrument micro-detail but the overall presentation is more realistic with more spatial detail due to a much more 3D presentation with the SA-43. When listening to Virtual Barber shop, the JH16 sound far less convincing even though noises from the extreme side were similar. Music notes on the JH16 decay a little faster than on the SA-43 leading to a more analytical sound while the SA-43, although not too much different, offers a richer presentation. With lower end DAPs the JH-16 outperforms the SA-43, especially in speed and punch, but the differences become much smaller as you go up the source chain and with high quality sources/amps the differences are minimal. While they are similar overall, the treble presentation and 3D spaciousness result in different strengths for each. Rooth LS8: Starting with the bass, the JH16 has more bass enhancement, bass depth and can reproduce more bass and sub-bass rumble than the LS8, but the LS8 is slightly warmer. In some songs I felt the bass of the JH16 was a little too much, but I didn’t feel the same way with the LS8, although the bass detail, texturing, speed, and punch are similar. The midrange of the LS8 is slightly thinner yet smoother and more detailed to go with a more liquid treble vs. the more analytical sound of the JH16. This allows the LS8 upper mid/treble peak, which is more substantial than that in the JH16 to still be primarily free of sibilance and offer a smoother presentation to go along with more clarity than the JH16. The soundstage of the LS8 isn’t quite as wide but is more 3D which is not readily apparent in music such as trance, but it is in many of my acoustic tracks. This can lead to instruments ending up in different places when A/Bing with the LS8 sounding more lifelike. The treble of the LS8 extends further than that of the JH16 and is flatter in my ear. Overall, the JH16 is more bass heavy and has more midrange richness to go with less upper midrange emphasis compared with the LS8 which has better clarity and treble extension and performance. Both are punchy and lean toward the analytical side of things, however the LS8 is more on the analytical side. Spiral Ear SE 5-way Reference: These two have a very different presentation to them so they would either be compliments to each other or if like the sound of one, you won’t really consider the other. The JH16 has continuously enhanced bass and while the 5-way can output massive amounts of bass, the bass quantity changes with the track vs. the ‘always on’ enhancement of the JH16. I would rate the quality similar between the two but with a little different presentation. Neither lack punch, but the JH16 is punchier in general. Neither lack the ability to reverberate and sustain deep bass notes, but the JH16 has more rumble in the deep bass. However, when it comes to sustained bass notes in drums, strings, and organs the 5-way has a more natural portrayal due to more realistic sounding sustainment. In some songs where there are massive amounts of bass the 5-way can output more overall bass resulting in a more “live” feel, such as Chemical Brothers live at Coachella. The midrange of the 5-way is richer and more forward in comparison with the JH16, sounding organic to the analytical sound of the JH. Detail levels of the instruments are about similar between the two, although the JH16 in general presents the midrange the same regardless of the master which can lead to better clarity. This is due to the 5-way being more transparent; the 6K boost of the JH16 adds clarity regardless of the masters which can result in a clearer presentation from the JH16 with poor mastering. The JH16 is brighter but doesn’t have the air or extension of the 5-way, which also has a more liquid presentation while retaining similar instrument detail. Cymbals shimmy more with the 5-way, but in general note detail is brought more to the front with the JH16. The tone is different as the 5-way doesn’t have the 6K peak, which leads to a richer and more natural sound in vocals and many instruments to my ears. As mentioned several other times in this review, the JH16 doesn’t offer the best soundstage depth or height which is an area where the SE 5-way excels, as the proportions are very realistic adding additional layers and ambiance to the sound when it is there in the music. The width isn’t much smaller than the JH16, so you give up little to get a lot. You know where each instrument is and there is a great sense of space with the 5-way that is not portrayed with the JH16. There are many current pop songs that don’t contain that information and the superior width of the JH16 is very entertaining with those songs, although the 5-way still somehow reveals something extra in those tracks. Overall, the 5-way has a more 3D presentation that doesn’t lag far behind the JH16 in width and presents music with more richness/thickness while blending the whole presentation together into a realistic performance while the JH16 picks apart the instruments and serves up the details to you. Overall resolution of the 5-way is higher but instrument detail levels are close between these two. While the presentation of the 5-way changes with mastering, the JH16 has a more consistent sound regardless of the track. As stated at the beginning, these two are quite different and of course the 5-way is a good chunk more expensive! Earsonics EM3 Pro: A/Bing the two results in a shock when going from the JH16 to the EM3 Pro as the EM3 Pro is much more mid-forward and thicker with less clarity. The JH16 has a wider presentation while the EM3 Pro is has great depth and a better height presentation. These two definitely aren’t similar to each other in most ways except technically they are at approximately the same level with the JH16 taking home the medal in speed, clarity, and detail while the EM3 Pro is more transparent with a more accurate soundstage proportion/positioning. The EM3 Pro presents music like you are on stage with the performers while the JH16 is more in line with a typical listening position. I can see the JH16 being more popular just from that standpoint. The EM3 Pro has a thick, rich, and organic presentation where the details of individual instruments are somewhat lost in the presentation while the JH16 has fantastic detail in the individual instruments to go with the more analytical presentation, yet isn’t as strong in the overall presentation. The JH16 conveys details the EM3 Pro misses, or I at least really have to listen for while the EM3 Pro conveys atmosphere the JH16 misses, or hides between instruments placed in a more compressed space. As with the 5-way, these either complement each other or you will probably like one but not the other. Ear Power EP-10 Plus: This is an interesting comparison for me from a perspective of comparing the bass. But starting with the treble, which is presented similarly between the two, the JH16 treble sounds brighter and a little more refined and detailed. The EP-10 Plus is very thick in the lower registers which creates a veil while the JH16 cuts through the presentation like a knife in comparison. The midrange is vastly different between the two with the EP-10 plus mids being more forward and having a much thicker, too thick for my ears, presentation that clouds the detail while the JH16 mids are very clear. With EQ the mids of the EP-10 Plus sound better, but without there is no comparison for my ears. In many songs the JH16 keeps up quite well with the dynamic bass driver of the EP-10 Plus, however with very bass heavy songs such as Etiket – Revelation, the EP-10 Plus bass is more prominent with better reverberation and power. However, this does come with a slightly sloppy sound in comparison with the JH16 as well as a slower attack. The EP-10 Plus is more spacious than the JH16, but the difference between the two isn’t great, which is impressive considering the EP-10 Plus is open backed while the JH16 is closed. The two are also similar in height and depth, however the EP-10 Plus sounds more like you are at a concert (and closer to the back) while the JH16 sounds more like you are in a recording studio. 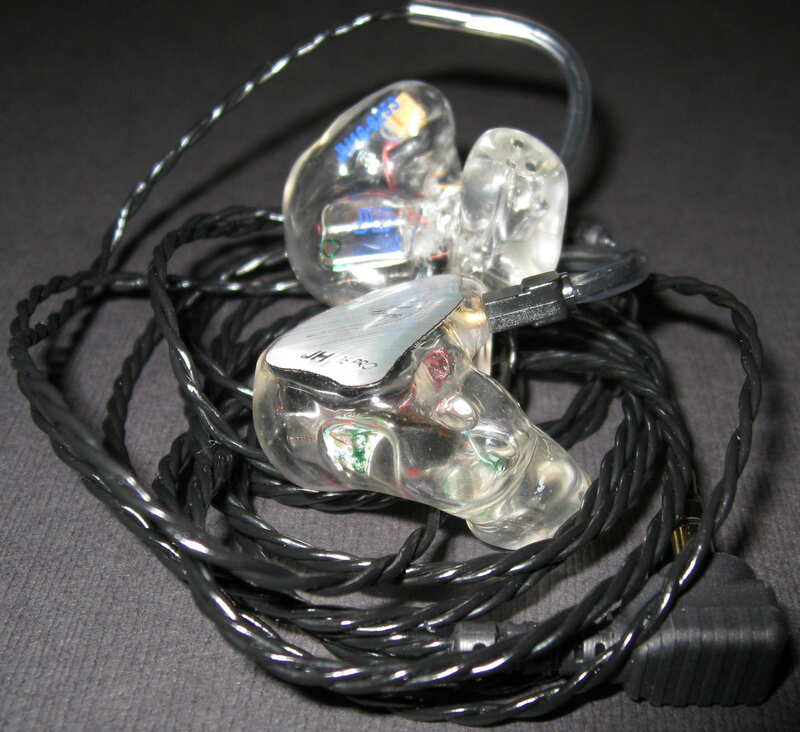 Ultimate Ears In-Ear Reference Monitor: The JH16 has much more bass emphasis and less midrange emphasis resulting in a more U shaped sound in comparison, but also a sound that is fuller than the UERM. They both have a brightness to them however the UERM treble is a bit brighter and presented more forward/intimate. The comparative difference of the midrange vs. the treble of each is pretty close, but the more forward midrange of the UERM gives a little more uniform presentation. While I find the JH16 midrange to be fairly neutral, it sounds a little sucked out in direct comparison with the UERM. Soundstage of the JH16 is wider but the UERM has better depth and height without giving up too much width. With certain genres such as speed metal and fast trance the JH16 has a sense of speed in comparison to the UERM, and this sense of speed sometimes carries over to genres it shouldn’t such as easy listening where the drums on many EBTG tracks are quick and punchy; not what they intended if you ask me! Both are technically similar overall and even have many similarities in the presentation, but the UERM would be a better fit for a recording engineer while I would choose the JH16 for on stage. For music enjoyment, the choice should be dependent on many things primarily revolving around the music you listen to and the quality of that music. Volume performance: The JH16 is a very sensitive custom IEM which does present some issues at low volumes with sources that have analog volume pots resulting in channel imbalances. At very low volumes the JH16 performs like a typical BA as the bass isn’t fully kicked in, but with a little tick up in the volume to a still low level the bass drivers start doing their thing, giving about average low level performance for the price range. Conclusion: Overall the JH16 has a fun sound that bring excitement to music and for me is great for use while I am working and concentrating on something else or working out while listening to energetic music such as pop and electronic. All things considered, they work quite well from something small and portable such as a Clip+ or less commonly found the RoCoo while not giving up all that much to something like the 801. The sound seems to be more along the lines of typical consumer sound that the general public want vs. the audiophile sound the a smaller population strive for. Not that audiophiles won’t like the sound, nor that the general public cares enough to spend the cash on the JH16, but with the law of averages there may be a larger audience for the JH16 sound than audiophile sound (Beats users?). The strengths play toward much of today’s pop/electronic music as the mastering overdone and doesn’t have a spacious soundstage. There are times when I really liked what I was hearing and times when I didn’t, but it was dependent on what music I was playing and what other headphones I had been listening to. Musicians on stage, which really is the focus of the JHA series, could benefit from the uber detail in their part of the music whatever it may be, vocals, drums, guitar, keyboard, etc. Sound Summary: Pumping out bass is one of the strong points of the JH16, as is an expansively wide soundstage, punchy and dynamic sound, and high levels of detail. The biggest issue is the soundstage depth and height which lead to a presentation that is wide, but in a line that results in less than ideal instrument placement and recreation of the overall presentation. Swaying to the analytical side, the JH16 does allow hearing the nuances of recordings, but due to the upper midrange/lower treble peak the clarity is often recreated that isn’t in the original recording, good or bad. Along those lines, the bass enhancement is in the on position at all times which can lead to enhanced bass in genres where it doesn’t sound like it should be there. The overall technical performance of the JH16 is very good, but personal preference and especially the music you listen to will play into how much you enjoy what it does. Source Summary: The JH16 doesn’t need much power to be driven well and headphone outputs from some DAPs sound quite good with the JH16, even if missing some of the micro-detail in the instruments. Due to the very high sensitivity of the JH16, sources with an analog volume control such as the 801 and HUD-MX1 had some issues at my normal low to very low listening volumes due to a channel imbalance which went away at moderate volume levels. The JH16 gives new meaning to bass with a performance that combines enhancement with dynamics, detail, punch, speed, and rumble. Instrument detail is plentiful across the spectrum with an added liquidity to the vocal range and an enhancement in the upper mids/lower treble that accentuates the clarity. Soundstage width is great and competes with/bests similarly priced custom IEMs I have heard. However the depth and height of the performance does fall short of the others, sounding compressed in comparison with tracks that are presented with a large 3D space. Music is presented in more of an analytical sort of way, so if you are looking for a thicker and more relaxed presentation, look elsewhere. Driving the JH16 is easy as a Clip+ does quite a good job and moving up the source chain doesn’t necessarily result in better overall sound except for a little more detail and possibly a larger soundstage with some music. Accessories are fine for this price point and when you use the dual case setup the JH16 will be well protected. The JH16 is great with today’s pop, hip hop, and a wide range of electronic music where it brings out the most of many over-saturated songs adding punch, detail, space, and excitement while acoustic music with a 3D presentation may disappoint due to the soundstage presentation not having the best depth/height. For the initial target market, on stage monitoring, the JH16 does perform quite well as it pulls out the details for you to hear and if you are a singer it presents vocals with added liquidity. The ability to customize the shell with artwork is nice and I get compliments on the look of mine. If you get the JH16 be prepared for enhanced bass regardless of what you are listening to, from rap to country, even if you don’t want the enhancement. – Dynamic, detailed sound that allows you to hear every detail of each instrument. Any chance the newer SE 5 Way Ultimate could fit the bill? Looking forward to your full review on that one. The SE5U is an upgrade, but the sound signature is very different. It really depends on what you want from a sound signature standpoint, and how much bass / treble you want. The Lear LCM BD4.2 would probably be a better choice because the bass is adjustable and the soundstage presentation is closer. Hey guys, love the write up on the JH16’s. To add to that, I love all of your down to earth reviews and believe your method of comparing to other gear to be the absolute best and unadulterated method. Thanks for what you do. As an owner of these CIEM’s I have to say that your review is spot on. I’m looking to add to my collection of CIEM’s though and would be grateful if you could give me a couple of recommendations. I love the warmth and musicality of the JH16’s but would love a bit more sparkle and air up top in the treble. I own the Sony ZX2, Chord Hugo and AK240SS if this makes any difference. Any ideas? Thanks in advance. Let me know if you have any specific questions about the above CIEMs. Far out you guys are good! Thanks so much for the prompt response. I really appreciate it. Will have a read of your reviews regarding the products you listed. Will be in touch with questions I’m sure.